A very quick post today as I’m on the home stretch with my last online university assignment and playing catch up with some discussion posts I missed while I was sick. As some of you might recall, this unit is Writing for Children and Young Adults and it’s been another excellent undergraduate level exploration. I’ve learnt a lot! 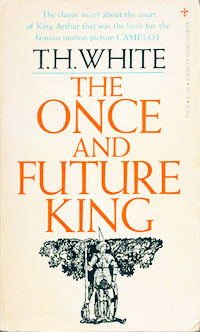 I found my self remembering T. H. White’s dark and somewhat forbidding retelling of the Arthurian legend in The Once and Future King series. This is all the more fascinating because I haven’t read these books since I was in early high school – around 40 years ago! Even though I couldn’t recall everything that happened in the four books, the overall feelings I gained from them remain to this day. I particularly loved the first book, The Sword in the Stone, which introduces the very old and absent minded Merlyn, who is living backwards through time, and Wart, the inquisitive and innocent adopted son of Sir Ector. Now I want to read them all again, to see if the magic is still there – or if my memory has embellished it. It also made me think about the profound effect that particular books can have and the amazing power of words on the human psyche. One book that sticks out as being something that had a profound effect on my early adolescent self was a book called “My Side of the Mountain” by Jean Craighead George. We had some progressive just-out-of-teachers-college and raring to go young teachers back then and our year 6 english teacher decided to read this book to us as part of the curriculum. I remember taking the book out of the library so that I could read it in one fell swoop as it spoke to me completely. I think that’s the thing about books. We all have our individual favourites and our relationships with books often feel as important as our relationships with people. I can hardly remember that teacher but I can remember everything about that book to this day.